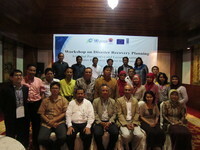 The workshop on disaster recovery planning was held at Sari Pan Pacific Hotel in Jakarta, Indonesia, 29-31 October 2012. 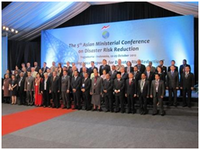 It was jointly organized by the National Disaster Management Agency (BNPB), UNDP Indonesia, UNISDR for Asia and the Pacific, European Commission (EC), and IRP/ADRC. The workshop was designed to support the initiatives of the Government of Indonesia for better disaster recovery operations, specifically at strengthening the manuals on Post Disaster Needs Assessment (PDNA) and Monitoring of Recovery Projects that were developed by the national government. The role of IRP/ADRC experts at the workshop was to provide technical assistance through sharing of lessons from global experiences. Dr. Syamsul Maarif (Head of BNPB) and Mr. Bambang (Deputy for Reconstruction and Recovery of BNPB) are among the over 35 officials who actively participated in the workshop. At the end of the event, participants outlined key recommendations for recovery planning, including review of spatial planning blueprint and localization of revised manuals on PDNA and Monitoring of Recovery Projects. To forward the recommendations from the participants, discussions between IRP/ADRC, AHA Centre, ASEAN Secretariat, and AusAID were facilitated. One of the key follow up activities is to strengthen regional partnerships to further enrich knowledge of integrating disaster recovery planning into their national DRR plans and other planning instruments. 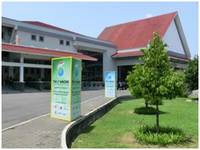 ADRC participated in the 5th AMCDRR held in Yogyakarta, Indonesia from 22 - 25 October 2012. Many participants comprising ministers of disaster management from more than 50 Asia-Pacific nations, representatives from UN agencies, international organizations, and NGOs attended this conference. The main theme of this conference is "Strengthening Local Capacity for Disaster Risk Reduction", and were discussed the various activities of disaster risk reduction at the local level. This conference was also discussed a new framework since 2015, the Hyogo Framework for Action has exited. In this meeting, ADRC held co-organized side events, and served as a facilitator of pre-conference. In the "Expert Meeting for the Disaster Risk Reduction Cooperation between Indonesia and Japan: To Enhance Local Capacity on DRR (Co-organized by BNPB and JICA)", ADRC's Executive director Natori served as the facilitator of the meeting. A symposium titled "Mainstreaming DRR toward post-HFA and Lessons Learnt from Mega Disasters" was co-organized by JICA and ADRC. ADRC made a presentation entitled "Lessons Learn from Mega Disasters and Implications for Mainstreaming of DRR". Organized by UN-SPIDER, a meeting named "Improve DRR practices based on the lessons learned from major disasters in Asia - A space technology intervention." was held. 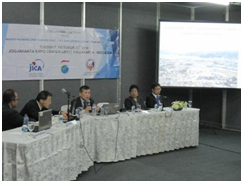 ADRC made a presentation entitled "Considerations for effective use of space based information to assess Tsunami impact - Lessons learned from recent Tsunami in Japan". ADRC and IRP participated in the Workshop on Stock-taking and Ways Forward in Capacity Development for Making Cities Resilient in Incheon, Republic of Korea on 19-21 September 2012, which was organized by UNISDR. Over fifty Resilient Cities Capacity Development (RCCD) partners, especially the capacity development service providers, came together to take a strategic look at approaches to implement programs that encourage sharing of experiences and discussion of options for addressing challenges. Outcomes of the workshop included recommendations for scaling up capacity building programs for resilient cities such as promoting city-to-city learning as well as strengthening the networks of service providers to facilitate wider access to cities. Both ADRC and IRP will be included in the list of service providers, which cities and other related stakeholders can collaborate for potential capacity building activities in the future. 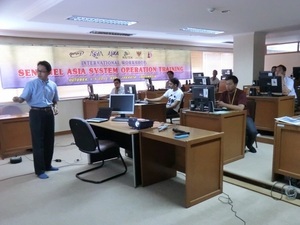 The 9th Sentinel Asia System (SAS) Operation Training was jointly organized by Japan Aerospace Exploration Agency (JAXA), Agency for the Assessment and Application of Technology (BPPT) and other some agencies from 1 to 5 October 2012 at BPPT in Jakarta Indonesia. More than 20 people participated in the training from space agencies in the Asia-Pacific region as well as relevant agencies. ADRC participated as an instructor in this training. The main contents of the training are as follows. ADRC gave a lecture of three themes entitled "ADRC Activities", "ADRC's role on Sentinel Asia Activities" and "Demands of disaster management organizations towards the Sentinel Asia Step 3".